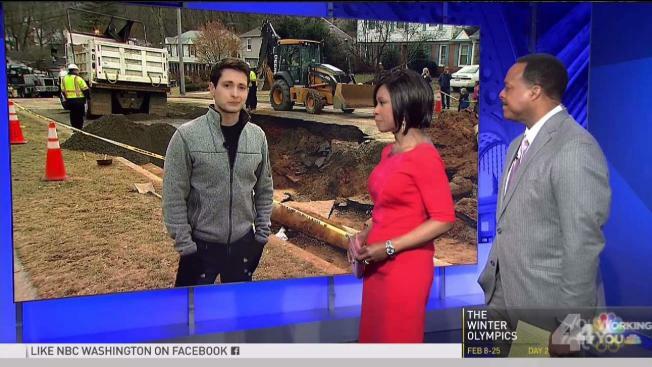 A water main break left a massive sinkhole in the middle of a neighborhood road in Fairfax, Virginia. Chopper4 footage shows the sinkhole is the size of at least five mid-sized cars. A resident saw the beginning of the sinkhole overnight and warned his neighbors to move their cars. A water main break occurred in the 4500 block of Twinbrook Road and caused the sinkhole, police said. Some people who live on the block worried the gaping hole could endanger their homes. Work to repair the water main and fill the hole is underway. It is expected to be complete Saturday.